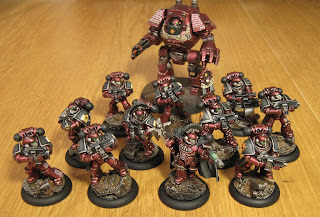 Well, felt it was time to get back to the Calth boxed set and start finishing off the Word Bearers force. It has been nearly a year since I started into that project! 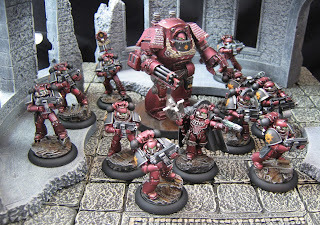 I had painted the Ultramarines in a pretty traditional manner (as you can see here), and I was going to do the same with the Word Bearers. 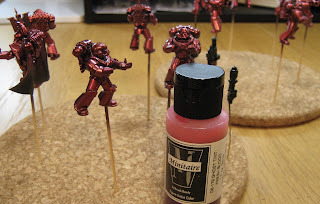 That is, until I saw a beautiful candied red metallic armour effect over on the Hotdrop Studios Facebook page. 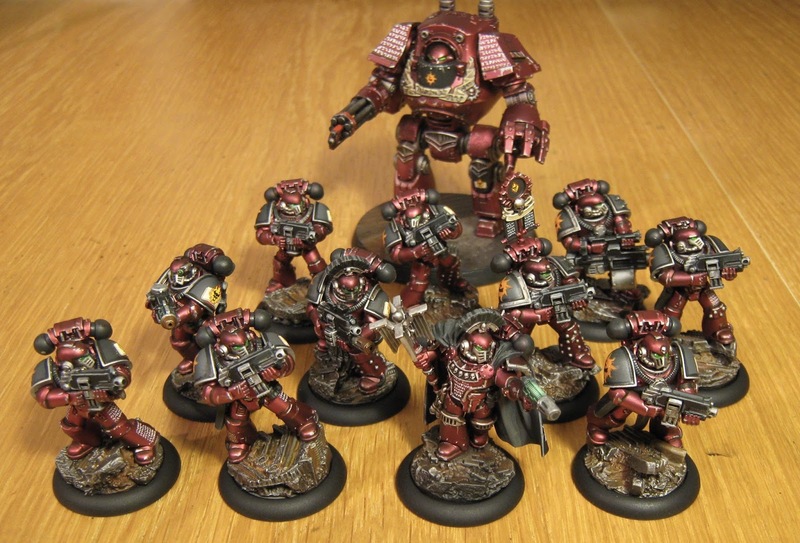 So, here's the first tacticl squad and the Dreadnaught. The method for getting the metallic armor effect has several steps...and it is pretty unforgiving, so if you try this, note that "going back and touching up mistakes" is pretty much impossible. Here's the step-by-step process. Step 1. 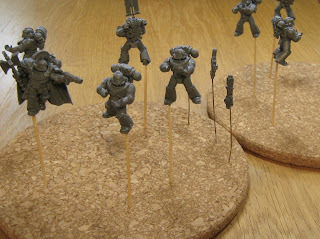 Assemble the models, clean up mould lines, leave off the guns and equipment, and mount everything on rods for easy handling (I used toothpicks). Step 2. 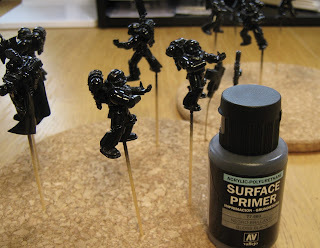 Apply a gloss black primer. Step 3. Spray a thin layer of gold. 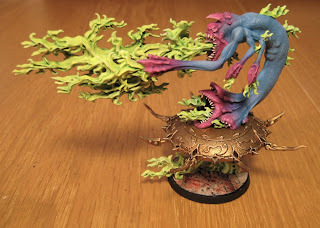 I used the new and most excellent Vallejo Metal Color. 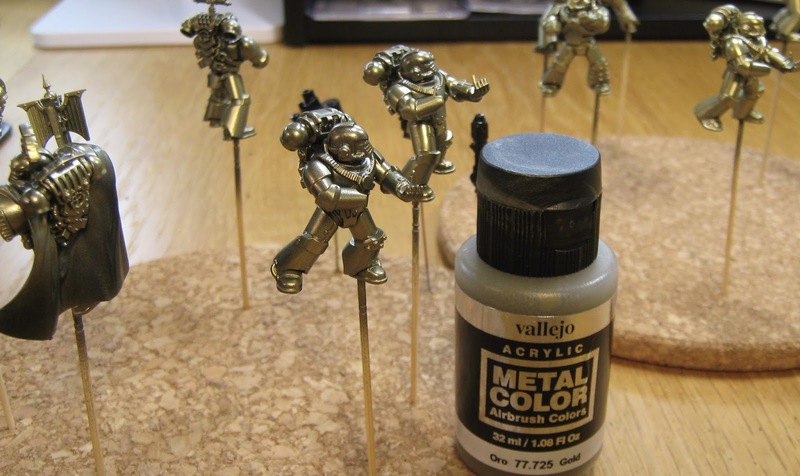 This line of metallic paints is absolutely amazing. Best available airbrush metallic paint by a mile. Step 4. OK...now for the secret sauce. Spray a thin coat of Minitaire Ghost Tint. I used Fresh Blood. Ick. Note: Minitaire Ghost Tints are unlike normal acrylic paints, inks or washes. They are very gummy and do not dry into a durable solid surface. 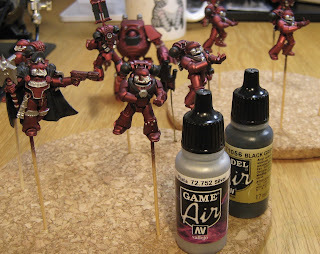 Spray very sparingly, as it is easy to plug up detail on the model's surface. Step 5. 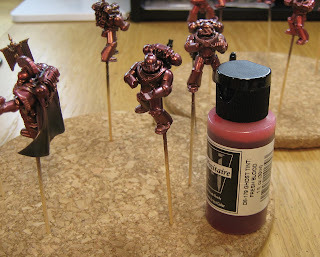 After the first coat is "dry" (and this is an aphorism), spray a second light coat to get a deeper colour. Step 6. Now, under a number of different lights, the Ghost Tint red will look like a very hot pink. 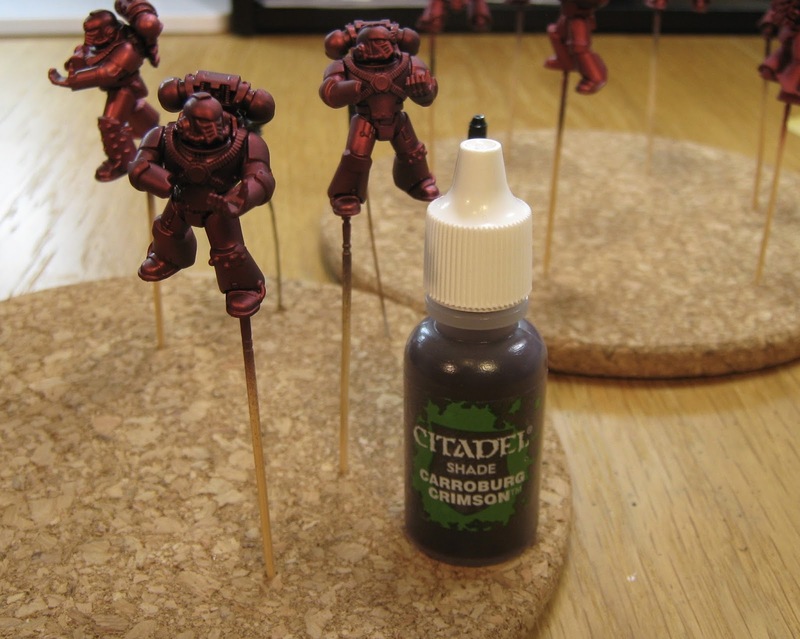 To get the proper red colour, and add some visual complexity and colour depth to the model surfaces, spray on a light coat of red wash. I used the Citadel Crimson shade colour, which is actually a very nice wash. Step 7. OK, time to proceed with the rest of the painting. Start with the silver and black fixtures on the models. Unfortunately, you have to be really careful from here on in. Any overpainting onto the red metallic surface cannot be fixed (at least, not without a lot of work). I used Game Air Silver and Model Air Black Grey. Step 8. 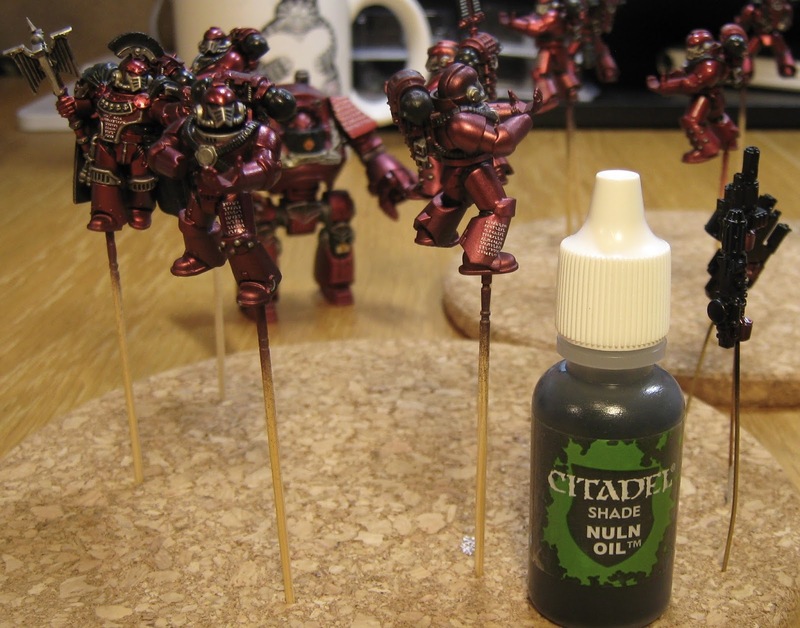 In anticipation of decal application, I sprayed on a gloss varnish at this point. Step 9. 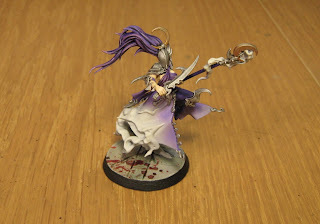 Here, all silver areas got a black wash, and then (numerous!) 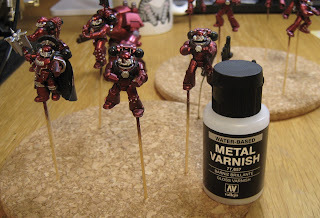 decals were applied to the armour. Step 10. While working on the main figures, I also did the shoulder pads. 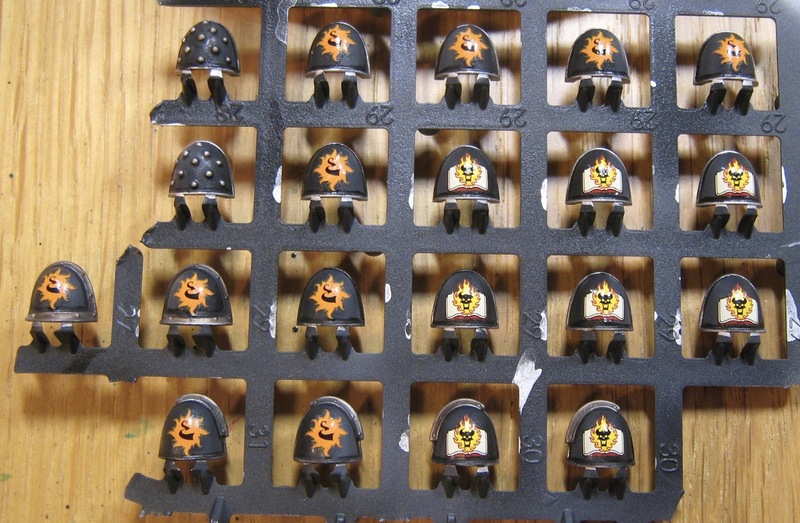 I kept these on the sprue as there are many of them, and they are small and fiddly. Easier to manage when they are all held in one place. Step 11. All armour shading was done with Vallejo Smoke. This is a relatively transparent colour that sort of acts like a wash. 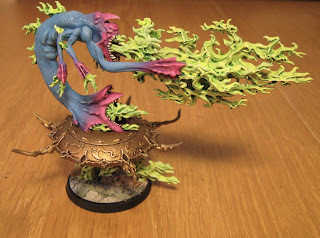 I added some glaze medium to the Smoke to get it to behave well on the figure surfaces. 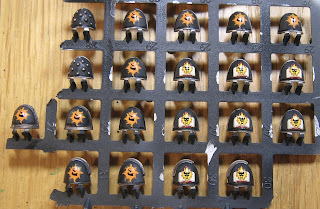 Using it very thin, I ran the brush around all the armour panels and pin washed the recessed lines in the figures. Step 12. 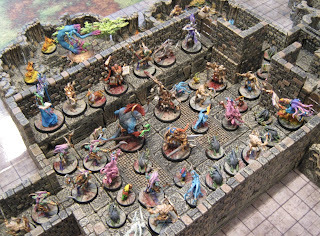 At this point, I added the miniatures to their bases (Micro Art inserts from Cool Mini or Not). Shoulder pads on. 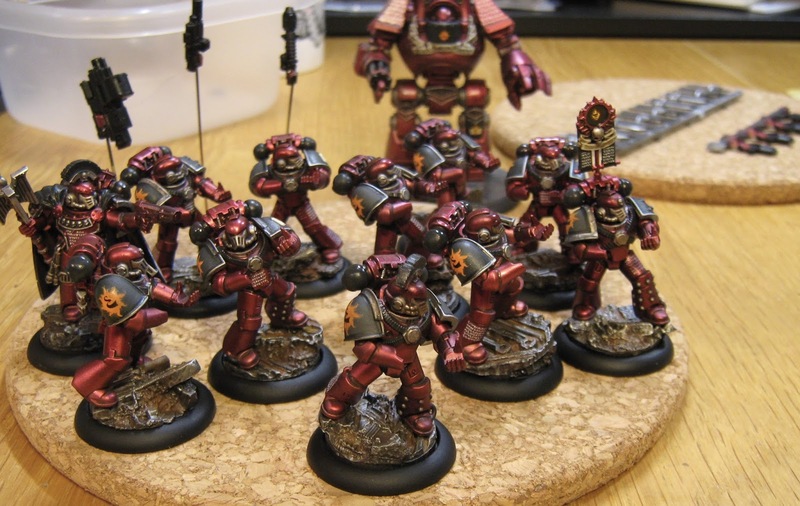 I then prepped all the weapons and equipment and got them ready to add to the models. Step 13. After final assembly, it was time to go in and highlight the models with silver scratches. Green eye lenses were also painted in. 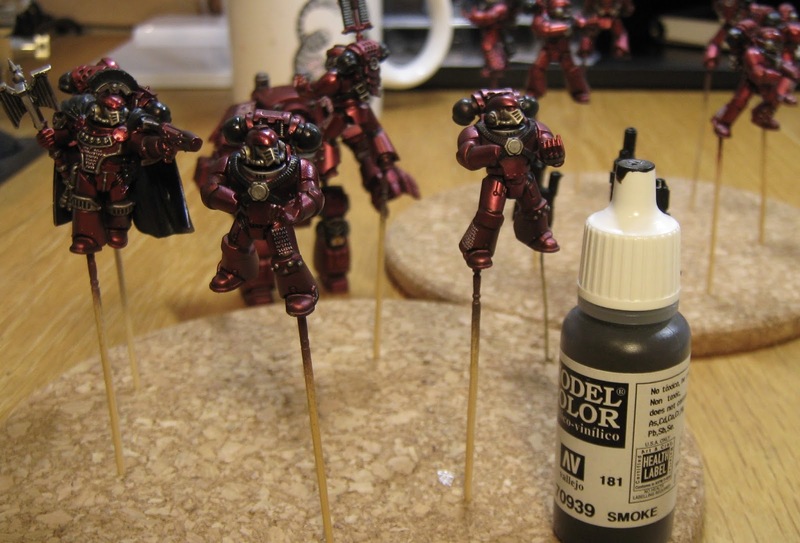 Two layers of Testors Dullcoat where then sprayed onto each model to bring the finish down to a scale-realistic satin. And the project was done. Personally, I really like the metallic effect you can get with the Ghost Tints. You just have to take your time with them and understand that it's pretty much impossible to correct mistakes. So...slow and careful! One more tactical squad to go. And this time, I have Forge World resin parts to incorporate. 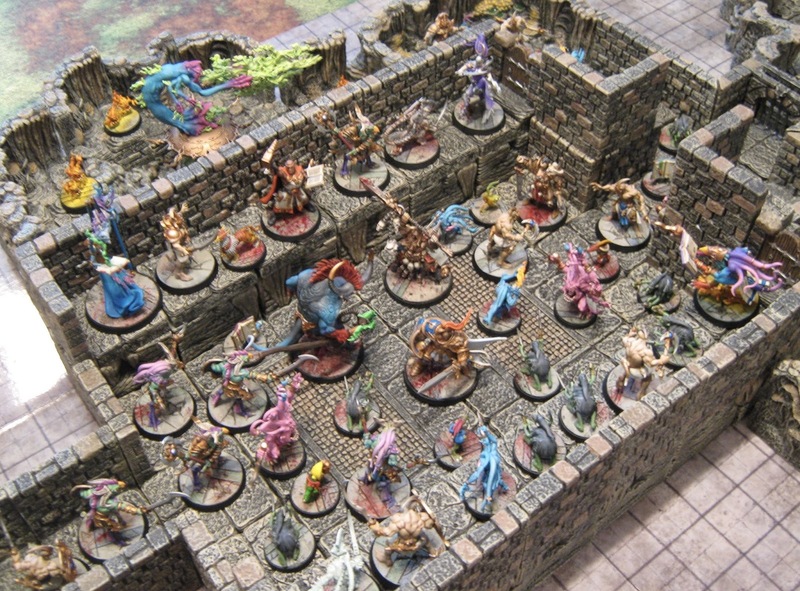 Getting ready for our first game of Silver Tower at the club, I discovered that new adversaries could be added to the random encounter tables during play. These are called Exotic Adversary Groups. So I built a couple. The first is this Exalted Flamer, which comes from the Burning Chariot kit for Chaos Demons. 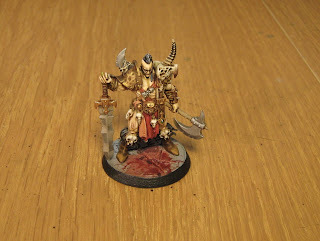 It turned out to be the biggest model in the set so far. That's a 40mm base hiding under the entire floating disk structure. 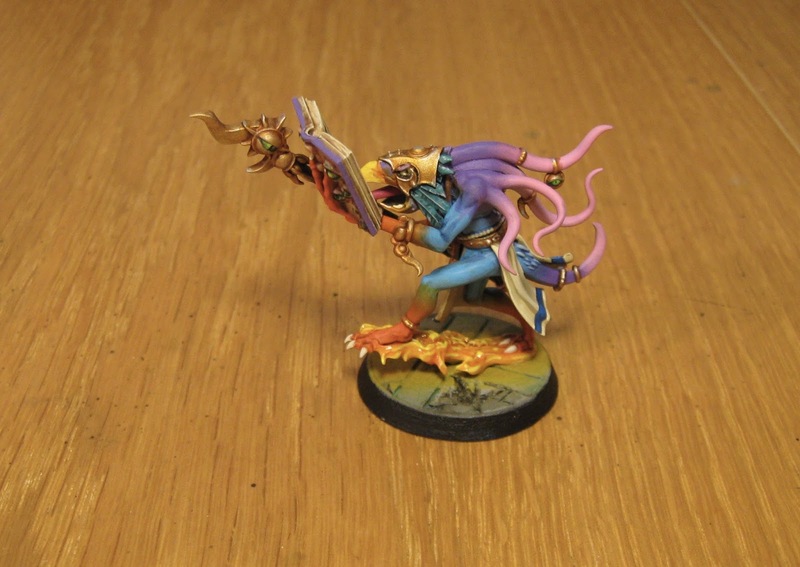 From the same kit comes the Herald of Tzeentch. There are many, many optional parts to build this relatively small model. But, because he comes with an Arcane Tome in the adversary description in the game, I made sure to build him with a book. 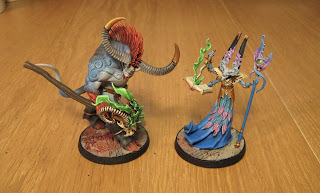 Both these models were painted primarily with the airbrush. Our first play experience in Silver Tower was fun...but the heroes ultimately lost, as enemies spawned faster than they could be dispatched. Looking forward to attempt number two. Well, that's going to be it for Silver Tower models for a while. Time to turn to other projects. 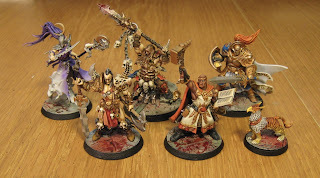 With all the Silver Tower adversaries painted, and a game coming up on Tuesday, it was time to get some heroes ready for the table. 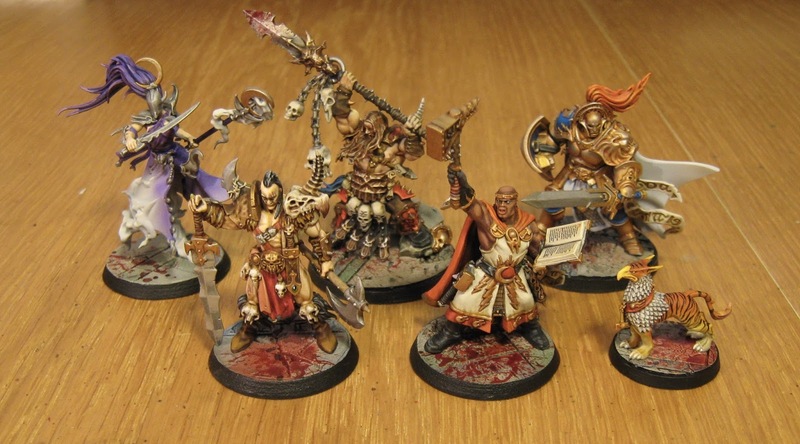 Four of these are from the boxed set, and one is an Age of Sigmar individual that has stats for the game. The large 32mm format for these figures gives you lots of detail to paint. Really like these figures. 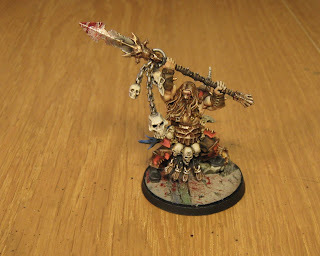 First up was the Exalted Deathbringer. 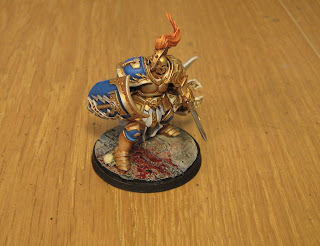 I bought this figure separately as my own hero for Silver Tower. No reason other than it's a pretty cool looking miniature. 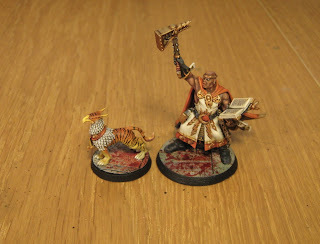 Then there is the Warpriest and Gryph-hound. Nothing quite like a dog crossed with a gryphon and painted like a tiger! This is the magic user from the set, called a Mistweaver. Tank = Knight-questor. Actually kind of fond of the standard Sig-marines paint scheme. That gold and blue looks good on the table. 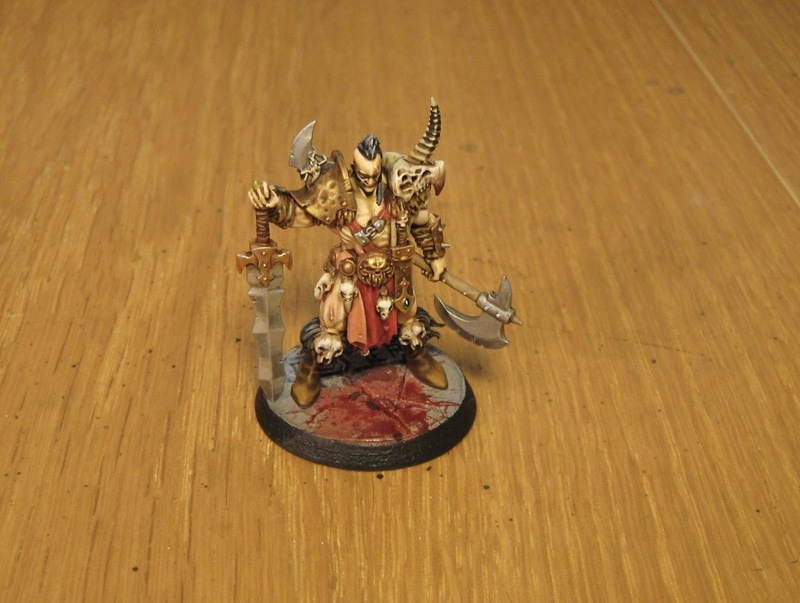 Finally in this batch we have the Darkoath barbarian dude. Lots of nicely sculpted and sharply cast detail on this figure. 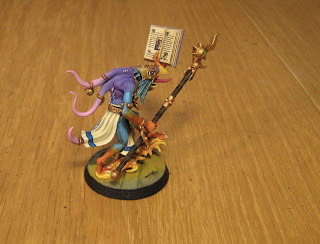 The Silver Tower boxed set does allow for adversary expansion, so I've started working on a Herald of Tzeentch. We'll see how he turns out. 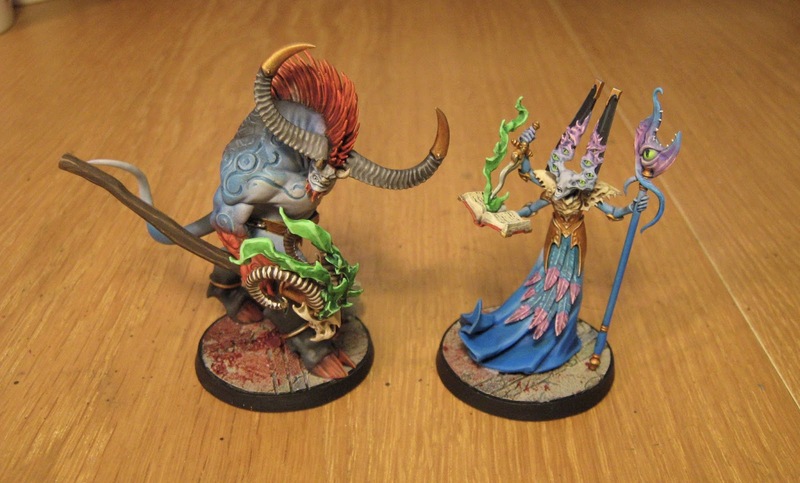 Finally, the last two adversary models from Silver Tower...done. I was traveling for a week and then got sick as a dog for another week. 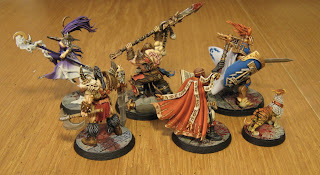 These guys should have come off the table some time ago...but better done late than never. 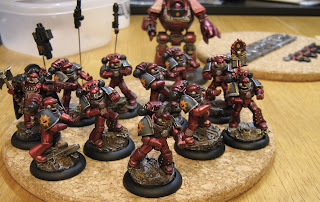 The models are fairly large, and required a bit of effort to finish off. Can't say I'm a big fan of my final work on them, but it sure does feel good to be a huge step closer to playing the game. 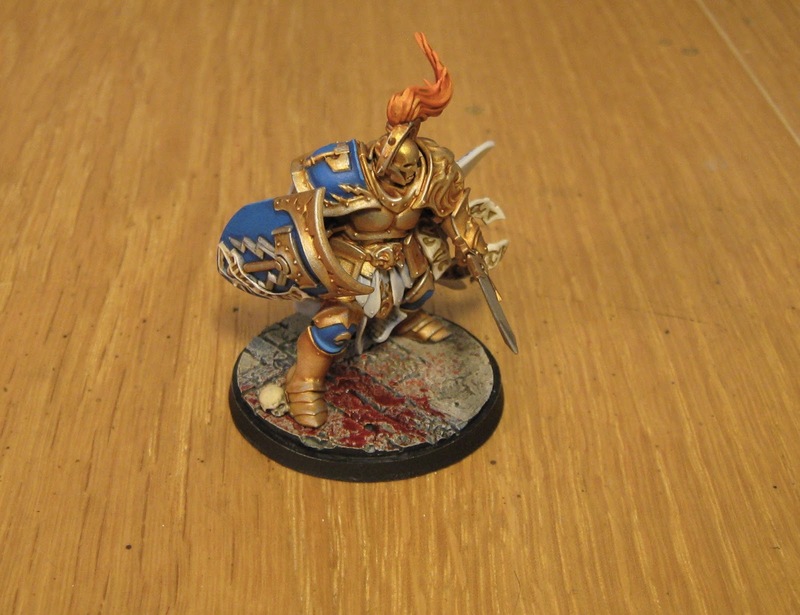 Speaking of which, the only thing left to do now is paint up some heroes. Here are some members of the first batch on the table...a few partially painted at this point. 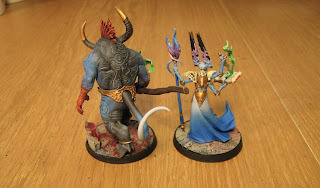 Hope to get a game of Silver Tower going next week at the club. Fingers crossed!